Deep Industry Benchmarks, Statistics, Financials and Revenue Forecasts. Choose from nearly 500 Industries. Updated and republished at least once yearly. 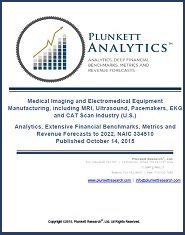 Plunkett Analytics reports are available from Plunkett Research for nearly all U.S. industries. They are priced at $1,995.00 per industry for a single user, and $4,995.00 per industry for enterprise-wide use. 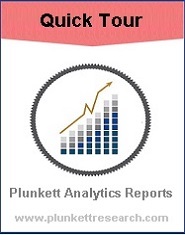 They may be purchased from your favorite market research report distributor, or directly from Plunkett Research, Ltd., by emailing info@plunkettresearch.com. Or, phone 713.932.0000, USA. The purpose of these analytical reports is to provide estimates of vital data, within the United States, on a per-industry basis. Comparisons of a) deep financials of the leading companies within an industry, b) all companies (public and private) to publicly-held companies, and c) one industry’s ratios to all other industries. Historical industry data going back several years for key figures including revenues, enterprises and sales per employee. Current and projected revenues, including forecasts for several years into the future. While many other research firms mine U.S. government data in order to publish industry-specific information, we believe that such efforts produce limited and often inaccurate results. Such data is most useful and accurate when it is scrubbed and standardized, and then used in conjunction with all available related data. 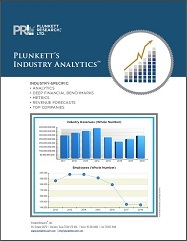 Plunkett Research has unique capabilities for creating industry information, due to the industry databases and research that Plunkett Research has been conducting for more than 20 years. Our access to hundreds of industry tables from our own databases, along with our databases of public and private company information, industry trends analysis and other resources, have been utilized fully in preparing this report.